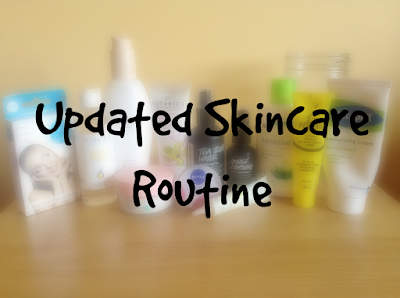 It has been a whole year since I have done a skincare routine post and I think now is as good as any to do one. I have normal to dry skin but during the Summer I get a little oilier on my forehead. My skin isn't excellent, I get spots (yay hormones) and I have a natural redness in my skin. 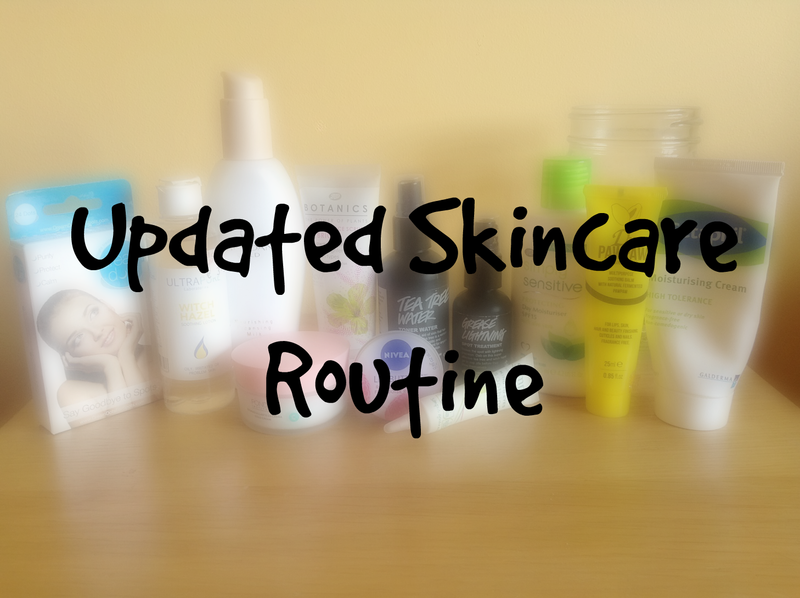 My skincare routine isn't perfect, some products I am just trying out or trying to get rid of, while others have been there for a while. This is a cream cleanser, I would best describe that it has the texture of a thick moisturiser. This hasn't been my favourite makeup remover, I think it's mostly to do with the smell but it doesn't smell that bad. I just much prefer coconut oil as a makeup remover. I bought this when I heard a YouTuber Melanie Murphy rave about it. It does the job, it's gentle and a little goes a long way with this, I never have to double cleanse unless I am wearing very heavy makeup. I use this when I am lazy or need to take off my makeup quickly. I like this cleanser, it comes in a pump bottle, which is amazing, it is gentle and it does a pretty good job at removing makeup. I find that it can't remove heavy makeup, waterproof mascara, eye liner etc. but apart from that it does a really good job. The only problem is that this stings my eyes if it gets anywhere near them which has never happened to me before. I have just started using this as my skin has gone against me recently. Witch hazel is amazing on spots and other skin impurities. I normally put a small amount on my face, leave it on for less than a minute and then wash off as it sometimes can dry out skin. I use this toner twice a day and spray it all over my face and pat it in. I love this toner, it doesn't have alcohol in it, it feels so refreshing and it's from Lush! I find it helped keep my skin looking and feeling nice. I exholiate twice a week, it isn't too harsh on my skin but after using it my skin feels so soft and healthy. I haven't noticed that it brightens my skin. This has been the third or fourth tube I have gone through and I will definitely be using this for another while, until they change the formula or something. Since Spring has finally started in Ireland in the past 2 or 3 weeks I decided that I needed a moisturiser with SPF or some kind in it, to protect my ghost like skin from the sun. I have been using this for 3 weeks and so far I like it. I feel it does the job as a day moisturiser but it does have the scent of sun cream, it isn't terrible but it is noticeable. I have had this in my collection for years, I got it when I had very dry skin around my eyes and I was recommended it by the Pharmacist. It is a thick moisturiser, perfect for a night moisturiser. The great thing with this moisturiser is that a little goes a long way. I only need a little amount to cover my face. I use this in the morning and the evening for the past few months and I found it hasn't done much for my under eye area. It is definitely soothing and refreshing to put on but I don't know if it is worth using if I can't find any see a difference in using it. This stuff, is my holy grail spot treatment. It reduces redness and the size of the spot overnight which is awesome. It smells of tea tree and all the other ingredients are natural in it since it is Lush. I use Dream Dots if I have a huge monster spot. They are overnight patches that you place on a spot and it helps to reduce the size and redness. They are a little pricey to use every day as it's €15 for 24 patches and I would go through them in less than a month. I love having them on standby just in case if a face demon tries to terrify me. I bought this on a whim last year and it is amazing. I use it's a lip balm but it can be used for other things. I sometimes get really chapped lips and I find this helps so much. It isn't very thick and absorbs quickly. This is an overnight lip balm/treatment I use. It leaves a thick moisturising layer over your lips and sometimes when I wake up the next morning I can still feel it on. I love the raspberry scent. What's in our skincare routine? Loved the post! I adore those lush products and the simple skincare moisturizer it's so amazing! The lush face masks are incredible I would definitely recommend trying them! Thanks for commenting Ailbhe! I love the Lush face masks but I haven't got one in a while, there needs to be a Lush store near me. Thank you! I haven't heard of the brand Mary Kay before but I'll definitely look out for it.